We're looking at that corner, and it is Blacks turn to play. unkx80: I think you asked for this problem somewhere else some time ago. The first time you asked it, I did not find the solution. This time, with some trial and error from the URL you gave me, I managed to find the unconditional kill. Please tell me whether you want the full solution sequence. For a hint, the first move is at 3-3. 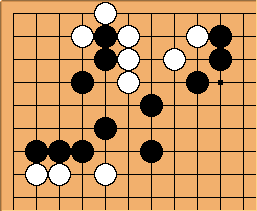 Then, sacrifice two stones using capture two recapture one, which leaves white with no eyes for the capture. Semper: Awsome Unkx80 ^^ thank you, I had tried that sequence before, except I had missed the stone on 1-4 and the idea of captur and recapture. Semper: Hello again ! There is another I am having a hard time with, I am probably just missing something simple, but if you could look at it I would appreciate it !